trademarklondon.com is the most informative website concerning some technical aspects like repairing compasses (beware of the painting's radiation hazard!). Some items are presented on videos. Be sure to switch the sound on to hear the descriptions. Moreover, you can download free of charge the excellent and comprehensive book "TRADEMARKLONDON" (see pics at left, 540 p.) about Francis Barker's life and oeuvre. POCKET WATCH-TYPE COMPASSES, HUNTER ETC. 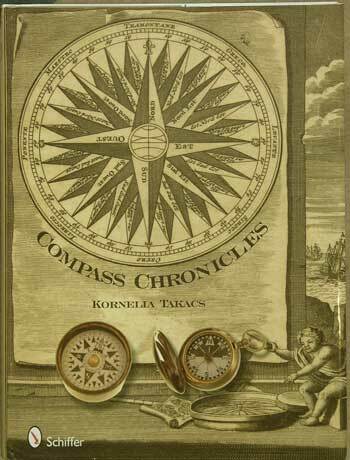 Kornelia Takacs is also the author of the Compass Chronicles. This book is a true milestone and a must for all compass collectors and whoever is interested in beautiful ancient instruments. (for orders go to CONTACT). the virtual museum of THE COMPASS COLLECTOR. - The German website Deutsche Luftwaffe shows all compasses of the historical German Airforce (Luftwaffe, 1914-1945) and many related documents. - The website Spitfire Spares displays British and German WWII compasses. - The website AeroAntique displays Warbird cockpits and instruments. - The Royal Airforce Museum's own website also displays many items with their data (via Navigator / search : "compass"). - The museum of Polands' aeronautics Muzeum Lotnictwa Polskiego offers an online library but the access is only possible on the Polish version, the English version is not implemented: first click on Zbiory in the pulldown menue, then on Biblioteka i Digitalizacja and then on the red words Digitalizacja zasobów ikonograficznych i archiwalnych MLP. The list comprises numerous works in several European Languages. - An excellent web site with background information about military compasses from many countries: Collecting Military Compasses. - Olive drab displays US military wrist compasses. the full catalogue of the Foundation's compass collection. - Compared technical features of some geological compasses by the Potsdam University (German) and list of available instruments on the website of the French University of Lille (French). - The website of the U.S. Geological Survey. 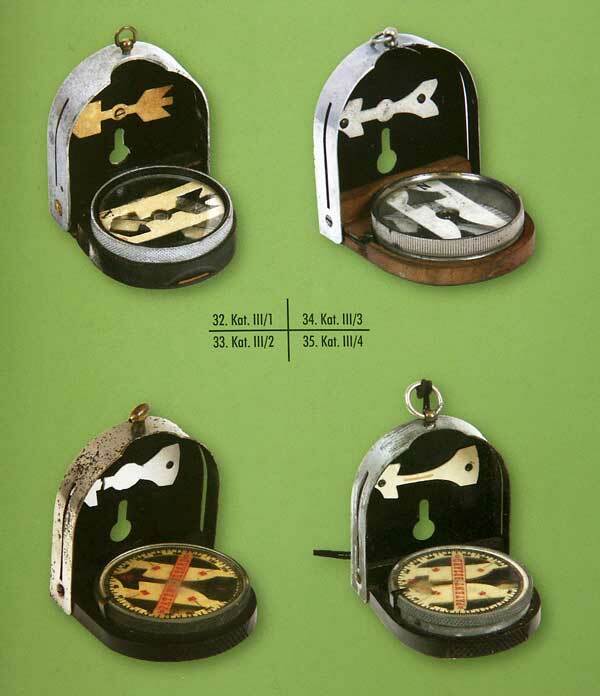 - Private collection of Russian survey compasses (Russian). 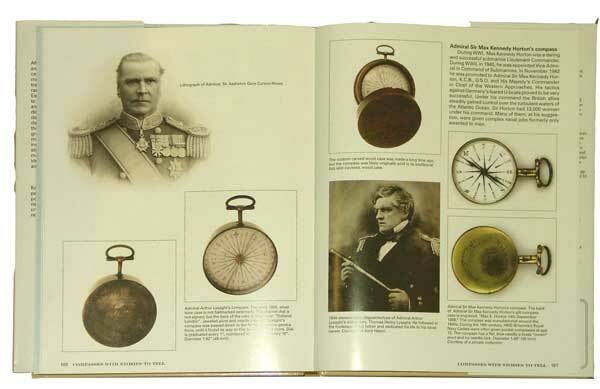 - Websites with lots of details about the famous BRUNTON compasses but also the fakes only made for decoration purposes. 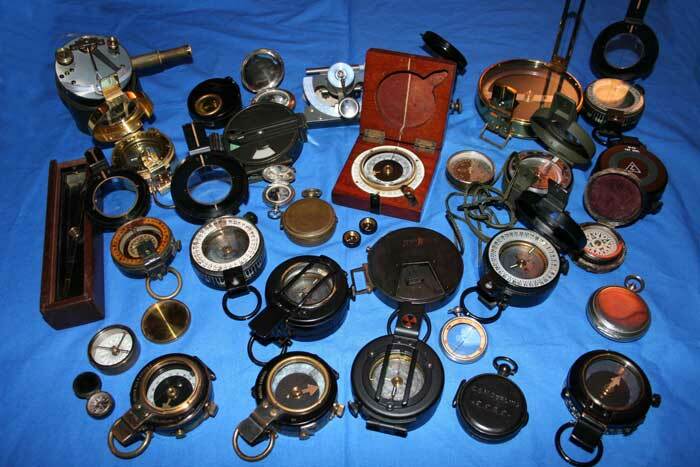 - Excellent Tutorial to learn handling a Brunton-type survey compass. 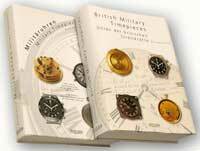 - A small collection of various gauges and compasses: thescubamuseum. 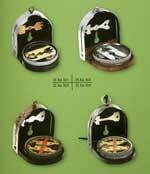 - A good shop for pocket compasses: THE BOREAL ARROW. - List of German company codes during WW II. - The website compasslibrary.com offers excellent antique instruments and rare books. Concerning the radioactivity in the paint of watches' and compasses' figures and markings: Vintage Watch Straps (find more information on www.trademarklondon.com). 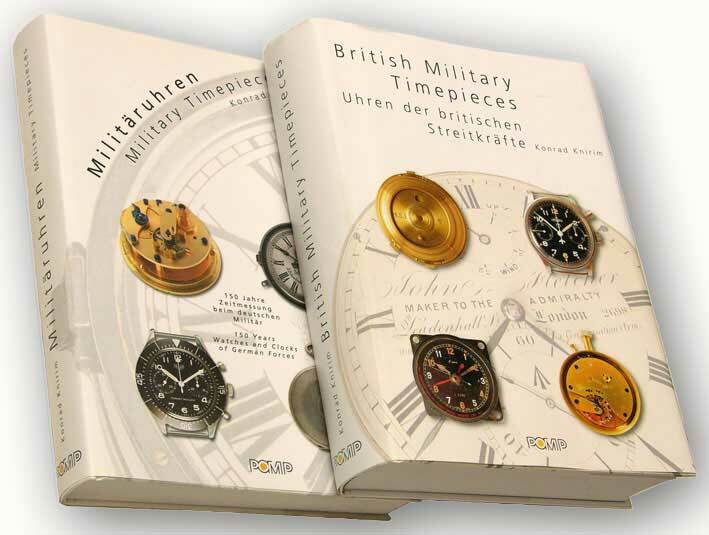 Discover the world of the military sun compasses in the excellent essay by Malcolm Barnfield The Sundial Goes to War on the website Sundials and also in Dr. Konrad Knirim's works about Military Time Pieces (see picture at right - Example: Lange & Söhne). - and for all those who miss the good old compass museum displayed on the website KITE FARM (Oregon Trail) that closed in 2008, you still can visit it thanks to web.archive.org. COMPASSIPEDIA doesn't deal with this topic since a collector (Jeff) plans to create a dedicated website. Jeff has been collecting compasses for over 10 years and has an array of compasses from the early 1920's to the 1980's. He literally has hundreds of compasses and photos of New Old Stock (NOS) and used compasses to include the following companies: AAA Compass, Airguide Instrument Company, American Parts, Automark Industries Incorporated, Cobbs Manufacturing, Dinsmore, Germany Auto Compass, Blackstone Manufacturing Cooperation, Donaldson Manufacturing Cooperation, Franklin Accessories, Hull Manufacturing Company, Napa, North Star, Noisom, Peerless, Pilot Compasses, Ranger, Sears, Shell, Sherrill Instrument Company, Taylor Instrument Company, Thermometer Corporation (TCA), U.S. Gauge Company, Wilson Freight Forwarding Company, Western Auto Sports, and the World Auto Compass Company. In addition, he has compasses that were specially made for automobile manufactures such as: American Motor Company (AMC), Buick, Cadillac, Chevrolet, Chrysler, Cord, De Soto, Dodge, Ford, General Motors Corporation (GMC) (GM), Hudson, International, Jeep, Kaiser, Lincoln, Mercury, Mopar, Nash, Oldsmobile, Packard, Plymouth, Pontiac, Studebaker, and Willys. He has both non-liquid and liquid filled compasses, non-illuminated and illuminated compasses both hard-wired and battery operated. Finally, he has miscellaneous compass that fit aviation, marine, auto, and tank applications.